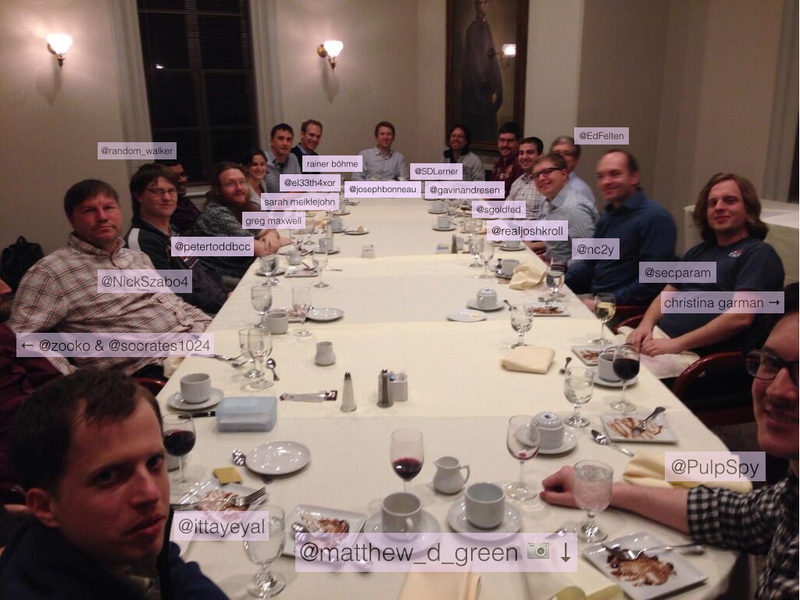 Reddit seems to have discovered this picture of a group of 20 Bitcoin people having dinner, and the community seems intrigued by Nick Szabo’s public presence. It’s actually an old picture, from March 2014. I was the chief instigator of that event, so let me tell the story of how that amazing group of people happened to be assembled at Princeton’s Prospect House. It started with an innocuous email from Matt Green to me pointing out that there were Bitcoin research groups in the DC/Baltimore area, Princeton, and Cornell, and that since Princeton was centrally located, it would be nice to get some folks in a room there for a day to toss around some ideas. I was immediately excited, but wanted to expand the group a little bit while still keeping it small enough to fit around a (large) table. In particular, I felt that Bitcoin developers and academic researchers had important things to say to each other, but had few chances to get together. So the workshop had to include devs. I was also interested in having people like Zooko Wilcox-O’Hearn and Nick Szabo — I couldn’t have cared less if Szabo was Satoshi or not, but he seemed to have interesting things to say about cryptocurrencies. With help from Ed Felten, Andrew Miller, and Joe Bonneau, I emailed a few people, and things sort of magically came together at short notice. (A big part of the “magic” is CITP’s competence at organizing events like these). We settled on a one-day private workshop followed by a one-day public conference, a formula that’s since been used successfully for various other CITP events. Unlike the workshop, the point of the conference is not to say novel things but to inform the public; you can watch the video recordings here. The workshop was immensely high-energy and fun, and was based on free-form round-table and breakout discussions instead of talks — a workshop as workshops should be. Everyone who was there seems to remember it fondly. We got a lot done in a day. For the Princeton group, it convinced us that we understood the science behind Bitcoin well enough that we should teach it. Later that summer, we taped our MOOC which is now free to the public, and has since expanded into a textbook-in-progress as well.